Howdy stamping friends! I am so sorry for popping in late with my card for the Paper Players this week. Ever have one of those weeks where you feel like you are running to catch up with yourself? That was the kind of week I have had. Blah! But it is Sunday and time to move forward. So let's get to it, shall we? This week, the awesome Ann Schach is our "hostess with the most-est" and she has a fabulous theme challenge to play along with: "Give Thanks". there are a lot of ways to play this challenge, so we hope you will join us and show off your creativity. I knew I wanted to use the Perfectly Preserved stamp set for my card, but for some reason I seemed to have "lost" it in my stamp studio. It's pretty bad when you have to spend 45 minutes looking for the set you want to use only to find it UNDER something on your desk. Ugh!! So, after locating the stamp set in question, I created my card using Cindy Hall's fabulous sketch from Freshly Made Sketches as inspiration. Love, love, LOVE this layout!! I popped up almost every layer on my card. I love texture and dimension. After I got the card together, I realized I didn't plan on where to place a the sentiment. The little oval sentiment in this stamp set along with the coordinating punch are too fun! So cute and little...I love it! Texture, layers and a bow - oh my! This is beautiful - perfect blend of fall colors! Love all the textures and the little apples are perfect for this sketch. Anne Marie this is gorgeous and very creative. Love everything about it. 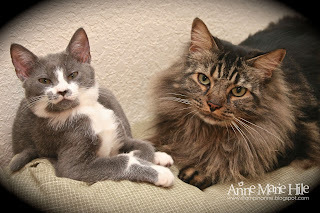 Loving the photo of the kitties. Wishing you a fab Monday. Wow .... such a feast of pretty fall colours - love the layers and loove the texture under the apples! Pure happiness! Oh so pretty....LOVE that bow, and your little apples are divine! Delicious! And I cannot believe you got those kitties to pose like that....you must be the cat whisperer! OK... Ill get to your fabulous card in a sec. Let me start with Abby. What a gorgeous little girl. How lucky she is to have been rescued by you and to have such a handsome companion in Tomas! the card.... love the little apples - so perfect for this time of year - and I love that you brought the apples from the base layer with the DSP to the focal layer. The bow is gorgeous, too! You know...I'm not a huge fan of apples, unless of course they're smothered in sugar and butter and located under a crust, BUT...your card really caught my eye and I had to pop in here and say how wonderful it is. The design is gorgeous too! Another awesome card Anne! I love the layout you used...TFS!!! Oh, my... those little apples are the cutest! I love your use of designer papers and textures. Thanks for joining us at FMS! Just another fab card!!!!! Sorry it took so long for you to find the stamp! That's happened to me!! Love the picture of the furry kids! Too cute!!! Gorgeous card Anne Marie! Love how you've stamped the apples in four differwnt colours - you always manage to combine lots of texture, colour an pattern perfectly! I know how you feel about your hectic week - I've had one too and am only just now beginning to catch up with myself! Your kitties look absolutely adorable by the way!! Pretty, pretty, pretty! Love the papers and those apples and that bow and..... Glad you joined us this week at FMS! Pretty fall card with all those apples... so colorful! And, your cats are way too CUTE! Sweet photos of them...thank you for sharing! Fabulous colors, fantastic layers, and style! All ingredients for a wonderful card! What an adorable card, Anne Marie! I love the texture...and of course, the pearls! You have once again done a marvelous job using the sketch and pushing the limits with the wonderful layers!! Love the little sentiment tucked in under the bow!! Your kitties look so sweet and very happy!